Compton Is Ready For HubCity Live! A Revolutionary New Development Project Destined To Become Urban America’s First Technologically Advanced Innovation Hub – HubCity Live! HubCity Live!, a proposed $145 million development in Compton, is aiming straight at Silicon Beach’s standing as the quintessential Los Angeles hub for attracting prestigious tech companies, celebrities, start-ups, artists and venture capitalists. Backed by a variety of A-list celebrities including Iyanla Vanzant, Laila Ali, and Rosario Dawson, the high-tech real estate development project will provide the City of Compton access to new jobs, training, entertainment and futuristic technology. The new 196,500 square foot high tech mixed-use complex will house a three-story cultural and educational center including a performing arts theatre and fitness facility, a five-story plaza with a Virtual Reality video game arcade, shops, restaurants and a seven-story innovation and business center with living labs, shared offices, advanced living areas, maker/hacker spaces and micro-flats. All three sustainable spaces will be equipped with test-bed Ubiquitous Computing technologies, systems and networks, allowing for a new wave of wireless information gathering with connected intuitive interactivity. Additionally, the three buildings will harmoniously extend and connect interior spaces to outdoor facilities for relaxation, recreation and reflection creating the ultimate nextgen lifestyle community. Once built, HubCity Live! 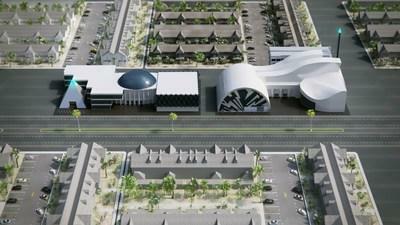 will be the most technologically advanced hub in the world. Led by The Bedford Group, Turner Construction, Curtom Dunsmuir, Digitech Designs, Conceptual Design Group and founders Armani Holdings and BlockpleX, the project is in preliminary discussions with Compton’s Mayor Aja Brown, councilmembers, the city manager and community stakeholders to secure the property. Located in the center of Los Angeles County, Compton is the perfect emerging neighborhood to house the innovative hub. HubCity Live! will transform Compton into a destination city, providing a diversified market for leading edge tech and new media companies; enhancing tourism and business opportunities; attracting artists, writers, musicians, designers and entertainers to the hub; creating an atmosphere for learning, cultural expression and contributing to a strong sense of community for future generations; bringing new fitness, shopping, entertainment and gaming spaces to the area and creating 500 permanent jobs and more than 1,000 temporary construction jobs. Hollywood icons Laila Ali, Rosario Dawson, Hillary Swank, Iyanla Vanzant and Siedah Garrett will also lend their support as advisory board members for this revolutionary innovative hub situated in an urban neighborhood. They are encouraging other celebrities, investors and venture philanthropists to take action and join them in this women’s led initiative. HubCity Live!’s architectural renderings were designed by Conceptual Design Group and BlockpleX. Inspired by Neo-Futuristic/Ancient Egyptian architecture, HubCity Live!’s elegant seamless, steel and Glass Fibre Reinforced Concrete (GFRC) design was born from a commitment to create a landmark that would help Compton reintroduce itself to the world, enhance its self-identity and formulate a new socio-economic and cultural vision. HubCity Live! will be situated on a 3-acre city-owned site. For more information, to view videos and to explore investment opportunities, please visit http://hubcitylive.com or contact Mikal Kamil at press@hubcitylive.com. Follow HubCity Live! on social media at @hubcityicon. I attended a fund raiser with Ricki BB over the weekend and inspired by the story she told about the project. Being born and raised in the City of Compton I was touched by the excitement and vision she express. I’m excited for the city and all the doors this will open for the community. I will be watching closely, following the progress and looking for ways to get involved.